Taiwan is showing how being fair to their minorities it can bring respect to the ruling majority. The population in Taiwan is approximately 23.4 million, spread unevenly across a total land area of about 36,000 km2; it is the seventeenth most densely populated country in the world with a population density of about 650 inhabitants per square kilometer. The original population of the island of Taiwan and its associated islands, i.e. not including Kinmen and the Matsu Islands, consisted of Taiwanese aborigines, speaking Austronesian languages and sharing mitochondrial DNA contribution with island peoples of Southeast Asia and the Pacific. Immigration of Han Chinese to the Penghu islands started as early as the 13th century, while settlement of the main island occurred from the 16th century, stimulated by the import of workers from Fujian by the Dutch in the 17th century. According to governmental statistics, over 95% of the Republic of China’s population is now made up of Han Chinese, while 2.3% are Taiwanese aborigines. Half the population are followers of one or a mixture of 25 recognized religions. Around 93% of the religious population are followers of a mixture of Buddhism, Taoism, and Confucianism, while a minority 4.5% are followers of Christianity. During the 20th century the population of Taiwan rose more than sevenfold, from about 3 million in 1905 to more than 22 million by 2001. This high growth was caused by a combination of factors, very high fertility rates up to the 1960s, and low mortality rates, and a surge in population as the Chinese Civil War ended, and the Kuomintang (KMT) forces retreated, bringing an influx of 1.2 to 2 million soldiers and civilians to Taiwan in 1948–1949. Above was a long way of explaining that mainland Han Chinese have colonized the Taiwan Island and brutally eliminated the Indigenous Peoples. The remaining Indigenous Peoples of the island live in the mountains in rather small communities that include also 30 townships. so the Taiwanese government was struggling with the idea of defining how many different groupings there are. These are figures for 2016.
the Taiwan Constitution in favor of “INDIGENOUS PEOPLE” – a stepto correct the fact that they were not allowed self government. entities is 16 – recognizing thus 16 Peoples with their rights to self government and the right to decide by themselves who belongs to their PEOPLE (Nation?). THIS IS THE INDIGENOUS PEOPLES BASIC LAW OF TAIWAN. These Indigenous Peoples have a guaranteed 9 seats in the TAIWAN legislature and appoint the 30 mayors of the townships mentioned earlier. in its difficult position versus China. Globally, there are 5000 languages when talking about he Indigenous as per Prof. Elsa Stamatopoulou who was part of the UN office that promoted the subject in the UN treadmill. She also mentioned that the subject was brought up already in the League of Nations in 1923. Fareed: Trump’s True Legacy – MAKE CHINA GREAT AGAIN! Insights, analysis and must reads from CNN’s Fareed Zakaria and the Global Public Square team, compiled by Global Briefing editor Jason Miks. Trump’s Legacy: “Make China Great Again”? The “slash-and-burn” approach of President Trump’s executive order on climate rules not only makes “one of humanity’s greatest ever challenges more difficult,” suggests Damian Carrington in The Guardian. It also leaves the door wide open for Beijing to assume America’s global leadership role. China “is now taking dramatic action to cut emissions, pushed by the foul air many of its citizens suffer and pulled by the likelihood of the low-carbon economy being the greatest growth story of the 21st century,” he says. China has almost completed major construction of “military and dual-use infrastructure” on three reefs in disputed waters in the South China Sea, according to a new report from the Asia Maritime Transparency Initiative think tank, based on satellite images. “Beijing can now deploy military assets, including combat aircraft and mobile missile launchers, to the Spratly Islands at any time,” the report says. Beijing, though, would dispute the disputed label, CNN reports. “Whether we decide to deploy or not deploy relevant military equipment, it is within our scope of sovereignty. It’s our right to self-defense and self-preservation as recognized by international law,” a Chinese Ministry of Foreign Affairs spokeswoman is quoted as saying. China to work with UNEP in order to assist Developing Countries in the fight against Global Climate Change! UNEP and China collaboration to help Global South fight climate change. The United Nations Environment Programme (UNEP) and China have agreed to assist Global South countries in fighting climate change. The new agreement was endorsed last week in Nairobi by Chinese Premier Li Keqiang and UN Under-Secretary-General and UNEP Executive Director Achim Steiner. During the discussions, efforts to accelerate China’s transition to a green economy were also addressed. They also discussed China’s newly declared “war” on air pollution and the top issues on the agenda of the inaugural United Nations Environment Assembly (UNEA), that is will be held in Nairobi in June. UNEP and China have collaborated with countries across Africa and Asia on climate adaptation projects since 2008 which have been financed by the Global Environment Facility and the Chinese government. Oil & Water – but it is not what we thought – it is about paintings. WE HOPE WE CAN CONVINCE THESE CHINESE TO TAKE A LOOK AT OIL & WATER IN THE FUTURE OF CHINA – AND TALK OF OIL & WATER IN TERMS OF SUSTAINABLILITY! In 2014 the Chinese New Year starts Friday January 31st and in CHINA will be cellebrated without Firecrackers. These were forbidden by the country’s weatherforcaster as heavy smog is expected even without this added menace. 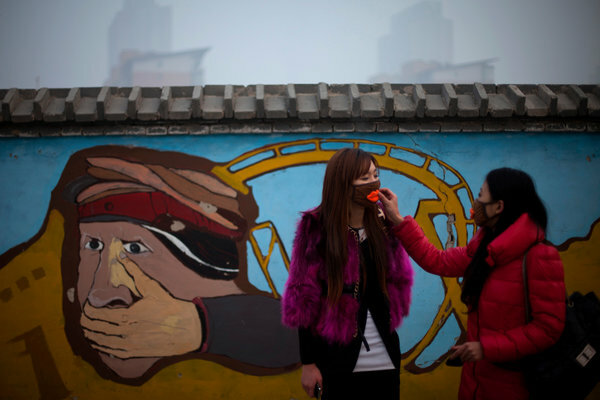 China smog fears spur call for ban on New Year fireworks. People ride along a bridge on a smoggy day in Nanjing, Jiangsu province, January 18, 2014. Warnings of heavy smog over central and eastern China this week have prompted the country’s weather forecaster to call for a ban on the fireworks traditionally let off at Lunar New Year, state media said on Wednesday. Chinese New Year, which begins on Friday, is marked by riotous displays of fireworks thought to bring good luck, but which turn cities into a semblance of war zones and blacken the skies with thick smoke for hours on end. With smog expected to start blanketing central and eastern China from Thursday, Chen Zhenlin, spokesman for the China Meteorological Administration, said local governments should ban fireworks completely, the official China Daily said. “Firecrackers and fireworks can release large amounts of toxic gas and particles such as sulfur dioxide, which will cause severe air pollution,” Chen was quoted as saying. Authorities, including those in Beijing, have asked people to set off fewer fireworks this year to help improve air quality, though in the capital at least there have been no moves to close down the temporary stalls that sell the fireworks. Sales of fireworks have been flat so far in Beijing, the China Daily said, as people heed the calls for clearer skies. “We have reduced the number of fireworks in the city by roughly 13 percent this year and we are not confident all our fireworks in stock will be sold,” Wu Liyu, head of the Beijing Fireworks Co, told the paper. Air quality in cities increasingly worries China’s stability-obsessed leaders, anxious to damp potential unrest as more affluent citizens turn against a growth-at-all-costs economic model that has poisoned much of the country’s air, water and soil. Large parts of eastern China, including the prosperous and cosmopolitan commercial capital of Shanghai, have suffered thick palls of smog this winter, though Beijing has had fewer problems this year. Having gotten their education in “Smog-city” young Chinese prefer life in smaller, cleaner and less crowded towns. Urbanites Flee China’s Smog for Blue Skies. DALI, China — A typical morning for Lin Liya, a native of Shanghai transplanted to this ancient town in southwest China, goes like this: See her 3-year-old son off to school near the mountains; go for a half-hour run on the shores of Erhai Lake; and browse the local market for fresh vegetables and meat. Lin Liya, 34, a native of Shanghai who moved two years ago to Dali, in Yunnan Province, now runs every day along Erhai Lake. Song Yan, 31, held a meeting of a book club in the cafe bookstore, Song’s Nest, she opened in Dali in the spring. She finished her run one morning beneath cloudless blue skies and sat down with a visitor from Beijing in the lakeside boutique hotel started by her and her husband. At a time when hundreds of millions of Chinese, many poor farmers, are leaving their country homesteads to find work and tap into the energy of China’s dynamic cities, a small number of urban dwellers have decided to make a reverse migration. Their change in lifestyle speaks volumes about anxieties over pollution, traffic, living costs, property values and the general stress found in China’s biggest coastal metropolises. Take air quality: Levels of fine particulate matter in some Chinese cities reach 40 times the recommended exposure limit set by the World Health Organization. This month, an official Chinese news report said an 8-year-old girl near Shanghai was hospitalized with lung cancer, the youngest such victim in China. Her doctor blamed air pollution. The town of Dali in Yunnan Province, nestled between a wall of 13,000-foot mountains and one of China’s largest freshwater lakes, is a popular destination. Increasingly, the indigenous ethnic Bai people of the area are leasing their village homes to ethnic Han, the dominant group in China, who turn up with suitcases and backpacks. They come with one-way tickets from places like Beijing, Shanghai, Guangzhou and Shenzhen, all of which have roaring economies but also populations of 15 million people or more. On Internet forums, the new arrivals to Dali discuss how to rent a house, where to shop, how to make a living and what schools are best for their children. Their presence is everywhere in the cobblestone streets of the old town. They run cafes, hotels and bookstores, and the younger ones sit on the streets selling trinkets from blankets. Some become farmers here, and some spend their days home schooling their children. Their presence has transformed Dali and surrounding villages into a cross between Provence and Haight-Ashbury. One magnet is the village of Shuanglang, which became a draw after the famous Yunnan natives Yang Liping, a dancer, and Zhao Qing, an artist, built homes there. As at other lakeside villages, the immigrants, some with immense wealth, live near fishermen and farmers. Ms. Lin said she first fell in love with Dali when she came as a backpacker in 2006. She returned twice before moving here. In 2010, on the third visit, she and her husband, whom she had met trekking in Yunnan, looked for land to lease to build a hotel on Erhai Lake. It has not all been easy going, Ms. Lin said, citing negotiations and misunderstandings with local officials, villagers and employees. That is a common refrain among parents here. One afternoon, four mothers, all urban refugees, sat outside a bookstore cafe, Song’s Nest, practicing English with one another. “The one thing we all have in common is we moved here to raise our children in a good environment,” one woman said. The bookshop’s owner, Song Yan, moved here this year and translates books by an Indian philosopher popular with Chinese spiritual seekers. One night, she and another translator and urban refugee, Zheng Yuantao, 33, talked over dinner about their moves. From the nearby lakeside village of Caicun, Huang Xiaoling, a photographer, flies back to Beijing to shoot portraits and events for clients. She had once lived in a courtyard home in the Chinese capital, but fled in September with her 3-year-old son and husband, an American who works remotely as a technology director for a New York publishing company. As per China Daily and official US and Australia information, Vice President Joe Biden is now the US link to China. Why does he not take along suggestions of co-operation on pollution-control which has become a main joint interest? News for Chen Weihua, Biden headed to Asia. 13 hours ago – The White House announced on Monday that Biden will visit Japan, … at chenweihua@chindailyusa.com and chinadaily.com.cn. 2 days ago – By Chen Weihua in Washington and Li Xiaokun in Beijing ( China Daily) Visits to Beijing, … Biden going to Japan, China, S. Korea next month. Raanan Katzir , China experience Missions. 2001-present Director, Sustainable Agriculture Consulting Group, “SACOG”. 2011 Beijing, Lecturing on Chinese Academy of Agricultural Sciences (CAAS)..
Lecturing on Dryland Farming Institute , Hebei Academy of Agricultural Sciences. 2011 Wuwei,Gansau: Lecturing on Gansu provincial desert control research institute. Lanzhou, Cold and Arid Regions, Environmental and Engineering Research Inst. Conservancy (TNC), Inner Mongolia project. System”, organized by Jiangxi Association for International Exchange of Personnel. 2013 Henan, Lecturing on Pingding University.2013 Gansu, a consultancy mission in Minqin. 2013 China, Ningbo, Zhejiang 2013 Symposium on Foreign Economy, Trade Technology and Talent. 2013 China, Taiyuan. 2013 Shanxi foreign experts Group Seminar. 2013 China, Fuzhou, China Cross-Straits Technology & Projects Fair. 2013 China, Fujian, Zhangzhou , Sino-Europe Agricultural Development Center. Lecturing on Fujian Academy of agricultural Sciences, Fujian Agricultural. Lecturing on Fujian Vocational College of Agriculture and Forestry University. Lecturing on Sustainable Agriculture. Awarded as an Honorary Professor. Visiting Zhangzhou Jiu-Bao Biotechnology Incorporation and Zhangzhou Science & technology Bureau. 2013 Zhejiang , Visiting Zhuji, Shaoxing District. 2013 Shanxi, visiting for field study tour and project proposals, Yonghe and Ruicheng Districts. •	Bio diversity, food security and environmental conservation. •	Ecological threat to open space areas. •	Agricultural Extension Methods to disseminate knowledge and technology. •	Advanced agricultural research in Israel. •	From subsistence to advanced marketing agriculture in the developing countries. •	Planning of Agricultural Projects. •	Combating desertification, the Israeli case story. •	Advance agriculture on arid land, the Israeli experience. •	Combating desertification, the global issue. •	Mitigation of factors causing agricultural natural disasters. The course on Sustainable Agriculture is aimed mostly to graduate and PhD students and also university staff professors. The course is focusing on the sustainable management of the natural resources as soil, water, crops, animal husbandry, climate and human resources, in order to maintain sustainable nature and produce food and raw material to obtain food security. The course is dealing with practical case stories, mostly of the Israeli experience and others. Participants will be able to understand and also analyze the rural sustainable management, planning and conducting of rural developing projects. Similar approach could be apply to conduct rural regional study tour as consultancies and producing documents on Ecological Impact Assessment (EIA), and project financial applications. The above topics could be presented also to advance farmers. The above topics fit participation on international conferences. 4 Efter St. Tel Aviv, 69362, ISRAEL. Agronomist, M. Sc. Agr., graduate from The Faculty of Agriculture, Hebrew University Jerusalem. Forty years of working experience with the Israeli Ministry of Agriculture in the fields of agricultural extension, plant protection, national coordinator of agricultural research and extension, head of national plant quarantine office and director of international projects in developing countries within the framework of the Israeli Agency for International Cooperation (CINADCO, MASHAV). Conducting post studies in France, South Africa and the US. I participated on tens of international conferences. I Published tenths of articles concerning my professional work. I have fully workable management of English, Spanish, French and Hebrew as mother language. I have often participated on international conferences and conducted tens of lecturing and consulting missions in the developing countries of South America, Africa, Central Europe, China, India and Oceania. In the last thirty years I specialized on Sustainable Agriculture, focusing on sustainable management of natural resources the like of soil, water, crops, animal husbandry, climate and human resource for the aim of agricultural production and food security. The basic approach is a holistic integrated management to conserve the natural resources for their future ability to generate food and avoid agro-ecological disturbances. My activity covers open field and protected agriculture (greenhouses), urban and peri-urban agriculture. I am a member of the Israeli Association of Engineers, the Israeli Societies of Entomology and Phytopathology and the International Society of Development (SID). General Secretary of OISCA-Israel an NGO connected to a mother NGO in Japan, dealing with environmental education, reforestation and international developing activities. Since retirement in 2001 from Israeli Government work,I became director of a Sustainable Agriculture Consulting Group (SACOG), engaged in lecturing, consulting and participation on conferences in Israel and in other industrial or developing countries. 1993 Beijing, China. One week International Symposium organized by the China Association for Science and Technology (CAST) on: Sustainable Agriculture and Rural Development. 1996 Hangzhou, China. Two-week seminar on water resource management for sustainable agriculture under semiarid conditions. 1999 Lanzhou, China.. International Conference, on Desertification. The Institute for Desert Research. Efficient Irrigation. Jiuquan, Combating Desertification and Desert Agriculture. 2002 China, Balikun County, Hami. Consultancy on mitigation of salinity soils. 2002 China, Saltland Greening Inst. Of Landscaping Co, TEDA , Tianjin. Conducting lectures on Sustainable Agriculture. 2002 China, Nanjing, Hohai Univ. conducting course on Sustainable Agriculture. 2002 China, Nanjing, Institute of Soil Science (CAS), lectures on Sustainable Agriculture. 2002 China, Lanzhou, Cold and Arid Environmental and Engineering Research Institute, Conference on Desertification, . Conducting a course on Sustainable Agriculture. 2002 China, Lanzhou, Arid Land Institute. Conducting a consulting mission in Eastern Lanzhou Province and lecturing a course on Sustainable Agriculture. 2002 China, Tailai, Heilongjiang Province. Conducting a consulting mission on rehabilitation of the sandy soils of the Tailai County. 2003 China, Sichuan, Chengdu. Provincial, Ministry of Agriculture. Conducting a course on Sustainable Agriculture. 2003 China, Guangdong, Guangzhou. South China Agricultural University. Conducting a course on Sustainable Agriculture. Agriculture on the following institutes: Dry Land Agriculture Inst., Gansu Agricultural University, Lanzhou University, Normal University, Cold and Arid Regions, Environmental and Engineering Research Inst. 2005 China, Guizhou Province, Guiyang City. Agricultural Bureau, Horticultural Department , consulting mission on a regional R&D Project. 2005 China , Guizhou Province, Guiyang City. Lecturing on Sustainable Agriculture in the Guizhou Normal University. 2006 China, Beijing, Eight International Conferences on Development of Dry Land. 2006 China, Shanghai, Jiao Tong University, lecturing on Sustainable Agriculture to students and staff. 2006, China, Sichuan Tibetan High Plateau, Khanding , Bamey, Daofu. A study tour to establish a Simplified Hydroponics and Micro farming project. 2006, China, Beijing, Geography and Natural Resource Inst. CAS, conducting lectures on Sustainable Agriculture. 2006, China, Beijing, China Agricultural University, presenting lecture on the advance desert agriculture in Israel. 2006 , China, Tianjin Agricultural University, conducting lectures on Sustainable Agriculture. 2007 China, Gansu, Dingxi, one week course on developing water resources and irrigation. 2007 China Chengdu, Sichuan. Conducting a one week course on Sustainable Agriculture . South West Universities for Nationalities. 2007 China, Shanghai, A consultancy on The Ecological Conservation of the Chongming Island , (Shanghai Academy of agricultural Science). 2008 China SHIHEZI University , Xinjiang , Conducting lectures on Sustainable Agriculture and a field study on advance desert farming. 2008 China , Inner Mongolia , Alaxa ( Alashan), in cooperation with NGOs ( SEE, OISCA, Heifer), activities of consultancy and lecturing on Combating Desertification. 2008 China, Turpan, Xinjiang , in cooperation with Heifer-China , conducting consultancy and lecturing on Combating Desertification. 2008 China, Lanzhou, Cold and Arid Regions, Environmental and Engineering Research Inst. CAS, Presenting a lecture on Sustainable Agriculture and Biotechnologies Methods. 2009 China, Lanzhou, Cold and Arid Regions, Environmental and Engineering Research Inst. (CARRERI), CAS, Presenting a one week course on Sustainable Agriculture. 2009 China, Dingxi, Presenting lectures on Sustainable Agriculture to experts of provincial Ministry of Agriculture and Water Authorities. 2010 China , Conducting courses on Sustainable Agriculture and consultancy field visits on Shanghai Jiao Tong University ( SJTU), and Sichuan Agricultural University (SICAU). 2010 China, Lanzhou, Cold and Arid Regions, Environmental and Engineering Research Inst. (CARRERI), CAS, Conducting a one week international. 2010 China, Guizhou Province, Guiyang City. Invited by the Guizhou Academy of Agriculture Sciences to lecture Sustainable Agricultural topics on the various institutes of the Academy. Office: “SACOG”, Sustainable Agriculture Consulting Group. 1953-1956 B.Sc. in Agriculture, Hebrew University of Jerusalem, the Faculty of Agriculture at Rehovot. 1958 M.Sc. in Agriculture, Hebrew University of Jerusalem, The Faculty of Agriculture at Rehovot, (Thesis: The Identification of the retention of copper fungicides for the control of tomato late blight, Phytophthora infestants). 1987-1990 Director of international courses and in-charge of liaison with scientific institutes, Ministry of Agriculture and Rural Development. Center for International Agricultural Development and Cooperation (CINADCO). 1977-1987 Head of Plant Quarantine Service, Ministry of Agriculture, Plant Protection Department. 1976-1977 Coordinator for professional (research, extension), activities, Ministry of Agriculture, Programming and Budgeting Division, as well as Lecturer in Plant Pathology at the Tel-Aviv University, Faculty of Life Sciences, conducting laboratory experiments. 1975-1976 Head of the Division for the Assessment of Natural Damage, Insurance Fund for Natural Risks in Agriculture. 1971-1975 In charge of coordination of professional activities, Ministry of Agriculture, Programming and Budgeting Division. 1970-1971 In charge of professional activities, Ministry of Agriculture, Extension Service, and Plant Protection Division. 1968-1970 Consultant to the Government of El Salvador, on behalf of the Division for International Cooperation, Ministry of Foreign Affairs, MASHAV, Israel and the Center for International Agricultural Development Cooperation (CINADCO), Ministry of Agriculture; in charge of the organization and implementation of a program on plant protection methods and techniques for pest control and extension activities. 1960-1968 Regional Extension Specialist in Plant Protection, Central Coast Area of Israel, Ministry of Agriculture, Extension Service; plant pest control; organizing courses and lectures for farmers on plant protection problems. 1959-1960 Commander of military agricultural training center; organizing and conducting agricultural courses for soldiers intending to establish agricultural settlements. 1958-1959 Responsible for the organization of agricultural courses at the military training center. 1967 Five months of studies in the field of Plant Protection. Diploma awarded by A.S.T.E.F.-Association for Technical Specialization, France. 1970 Three week Plant Protection Tour, organized by the University of California, Riverside, California. 1975 Two week study tour in Switzerland, organized by the Agricultural Crop Insurance Company, Zurich, Switzerland. 1979 Two month study tour in the U.S.A. (including Washington D.C., California, Florida, New York) on problems related to Plant Quarantine, under the auspices of U.S.D.A. and APHIS (Animal Plant Health Inspection Service). 1981 Two month study tour in the Republic of South Africa on quarantine problems, organized by the Ministry of Agriculture of South Africa. 1984 Two week course on Storage Pests, EPPO, FAO, Montpellier, France. 1989 Bad-Durkheim, Federal Republic of Germany. One-week conference on Integrated Pest Management in tropical and subtropical countries, organized by GTZ. Development Bank on IDB-European NGO’s on ecological problems. Development Bank on Social Sector Programs and Social Sector Reforms. 1993 Dar Es Salaam, Tanzania. One-week workshop organized by UNCTAD on commodity export policies in African countries in a process of structural adjustment: cotton, tea and horticultural products. 1994 Mexico City, Mexico. One week World Conference organized by the Society for International Development (SID) on: People’s Rights and Security-Sustainable Development Strategies for the 21st century. 1994 San Jose, Costa Rica. One-week conference, on Integrated Pest Management. 1996 San Jose, Costa Rica. One-week conference, on Agricultural Environmental issues. 1996 Santa Cruz, Bolivia, One week conference on Indigenous People in Latin America. 1996 Netanya, Israel. One-week conference, on Periurban Agriculture. Geneva, Switzerland, UNCTAD, One week working group on Development Policies in Resource-based economies. 1998 Gaza, Palestinian Authorities. One week work group on Peace Procedure and Agricultural Development. 1999 Bangalore, India. International Conference on MAN and NATURE, Organized by OISCA , South India. 1999 Lanzhou, China.. International Conference , on Desertification. Promoting Earth Ethics”. Organized by OISCA-International. 2001 Nitra, Slovakia , Symposium on “Agriculture for the quality of Human Life”. Organized by Animal Husbandry Research Institute, Nitra. 2002 Calicut, Kerala, India, Conference on “Biodiversity and Environment “ Organized by OISCA South India. 2002 China, Beijing, CALLAS Co. Conference on Seed Production in China. 2003 Switzerland, Lausanne, the International Conference for Sustainable Development and Environmental Remediation. Swiss Environmental Solution for Emerging Countries (SESEC II). 2003 Mexico, Chapala Jalisco. International II Symposium on Sustainable Communities in Mexico & USA. 2003 Slovakia, Nitra, International conference on Bread and Peace to All people. Presenting paper on Suastainable Agricultural Regional Development. 2003 USA, Fort Myers, ECHO 10th Annual Agricultural Mission conference. 2004 Mexico, Mazamitla. Primer Congreso Internacional “ Pobreza: la Cara del Esclavo Moderno” ( Poverty, the face of modern slavery). 2004 Japan, Amamatsu, representing Israel on OISCA International Board of Directors meeting. 2005 Mexico, Mazamitla. Secundo Congreso Internacional “ Pobreza: la Cara del Esclavo Moderno” ( Poverty, the face of modern slavery). 2005 Mexico, Chetumal, X Congrso Nacional y IV Congrso Internacional de Ciencias Ambientales. 2005 Japan, Gifu Perfecture, representing Israel on OISCA International Board of Directors meeting. Development and Environmental Remediation. Swiss Environmental Solution for Emerging Countries (SESEC IV). 2006, Slovakia, Nitra , International conference on “Water for life, water as element,” presenting paper on Water resources and irrigation methods to achieve advance agriculture in arid land. Congress of Horticultural Sciences, Protected Organic Agriculture Conference. 2007 Slovakia, . Nitra , International conference on “A forestation, presenting paper on Israeli experience on rain water harvesting and a forestation in arid land. 2010 Slovakia, Nitra , International conference on “Information Technologies in Agriculture”, presenting paper on Agro Bio Technologies, the Israeli Experience. 2010 Japan, Toyota City, representing Israel on OISCA International Board of 2010 Switzerland, Lausanne – The International Conference for Sustainable Development and Environmental Remediation. Swiss Environmental Solution For Emerging Countries (SESEC IX).Presenting a lecture on Agro Biodiversity. Professional Lectures Presented as single lectures or on-the-spot Courses, Consultancies and Other professional activities. 1973 Arequipa, Peru. Three week course, organized by the Israel Centre for International Cooperation of the Ministry of Foreign Affairs, MASHAV, and the Ministry of Agriculture, Peru, on: agricultural extension methods. 1973 La Serena, Chile. Three week course organized by the Israel Centre for International Cooperation of the Ministry of Foreign Affairs, MASHAV, and the Ministry of Agriculture, Chile on: Agricultural Extension Methods. 1974 Huancayo, Ciudad Trujillo, Peru. Two three-week courses organized by the Israel Centre for International Cooperation of the Ministry of Foreign Affairs, MASHAV, and the Ministry of Agriculture, Peru, on: agricultural extension methods. 1975 Santa Cruz, Bolivia. Two-week course organized by FAO on the efficient and safe use of pesticides in agriculture. 1975 Santiago de Verguas, Panama. Two-week course organized by FAO on the efficient and safe use of pesticides with emphasis on aerial and terrestrial use. 1977 Santiago, Chile. Two week course organized by the University of Chile, Faculty of Agronomy, Campus Antumapu, on the efficient and safe use of pesticides. 1977 Santa Tecla, El Salvador. Two-week course organized by the FAO and the Ministry of Agriculture of El-Salvador. Intensive training course, for the professional staff on the safe and efficient use of pesticides for coffee cultivation and technology transfer to the farmers of small farm holdings. 1985 Dar Es Salaam, Tanzania. Two-week course organized by the FAO on: the safe use and correct application of pesticides on small farm holdings. 1986 San Lorenzo, Paraguay. Two-week course organized by the FAO on: the safe use and correct application of pesticides on small farm holdings. 1988 Amatitlan, Guatemala. Three-week course organized by the Ministry of Agriculture on: Integrated Pest Management (IPM) and Agricultural Extension. 1988 Lima, Peru. Three-week course organized by the Ministry of Agriculture, Department of Crop Sanitation on: Integrated Pest Management with emphasis on Crop Quarantine. 1989 Katmandu, Nepal. Two weeks workshop organized by FAO on the safe and efficient use of pesticides. 1989 Centeno, Trinidad and Tobago. Training course organized by FAO on the safe and efficient use of pesticides in the English speaking countries of the Caribbean countries and Surinam. 1990 Mount Hagen, Papua New Guinea. Two week training workshop organized by the FAO on the safe and efficient use of pesticides. Raratonga, Cook Islands. Two week training workshop organized by FAO on safe and efficient use of pesticides. 1990 San Salvador, El Salvador. Survey organized by the Israel Centre for International Cooperation of the Ministry of Foreign Affairs, MASHAV, and the Ministry of Agriculture of El Salvador on: Study for the establishment of a plant clinic. 1990 Osaka, Japan, OISCA Kansai Training Center, a short course on Agricultural Extension Method. 2) Improvement and management of tomatoes. 1991 Enugu, Nigeria. Survey organized by the Catholic Institute for Development, Justice and Peace (CIDJAP) on: The Development of a Training and Demonstration Farm. 1992 Ciudad Arce, El Salvador. Three-week course organized by the Centro de Tecnologia (CEMA) on: Agroecology with emphasis on Integrated Pest Management (IPM). 1992 Enugu, Nigeria. Two week course organized by the Israel Centre for International Cooperation of the Ministry of Foreign Affairs, MASHAV, and the Catholic Institute for Development, Justice and Peace (CIDJAP) on: Agricultural Extension Methods. 1993 Quito, Ecuador. Survey organized by the Israel Centre for International Cooperation of the Ministry of Foreign Affairs, MASHAV, and the Ecuadorian Institute for Agrarian Reforms (IERAC) on: Study of Projects for Agricultural Development. 1993 Bogota, Colombia. Survey organized by the Departamento Nacional de Planeacion de la Republica de Colombia and the Israel Centre for International Cooperation of the Ministry of Foreign Affairs, MASHAV, on: A Project Plan for the Development of Tropical Fruits in the Atlantico Region. 1993 Chillan, Chile. Three-week course organized by the Faculty of Agriculture, Concepcion University on: Integrated Pest Management and Agricultural Extension Methods. 1993 Jarabacoa, Dominican Republic. Three-week course organized by the Junta Agroempresarial Dominicana (JAD) on: Integrated Pest Management and Agricultural Extension Methods. 1994 Zacapa, Quetzaltenango, Guatemala. Three-week course organized by OIRSA on: Integrated Pest Management. 1994 Plovdiv, Bulgaria. The Higher Institute of Agriculture. Two-week seminar, on Agroecology. 1994 Guacimo, Costa Rica, three week course, EARTH ( Escuela Agricola Regional Tropico Humedo), on Sustainable Agriculture. 1995 Quito, Ecuador, ESPE, Escuela Politecnica del Ejesito. Three-week seminar, on water resources and uses for agriculture, including agroecological problems. 1995 Burgas Free University, Bulgaria. Two-week seminar on, Agroecology. 1995 Chillan, Chile, Concepcion University, Faculty of Agriculture. Two-week seminar, on Agroecology. 1996 Grecia, Costa Rica. Two week seminar on agriculture environmental issues. 1996 Lima, Peru. One week survey on agricultural development projects , Fruit Production and Irrigation. Organized by MASHAV. 1996 Hanzhou, China. Two-week seminar, on water resource management for sustainable agriculture under semiarid conditions. 1997 Lublin, Poland. Two-week seminar, on Agroecology. 1997 Hamakita, Japan. OISCA Org. Three week seminar on Agroecology. 1997 Kunming, Yunnan, China. One-week survey on agricultural development projects. Doylestown, Pennsylvania, USA. Delaware Valley College (DVC), Two- weeks seminar on Sustainable Agriculture. Mexico, Oaxaca. One week MASHAV (Center for International Cooperation, Min. of Foreign Affairs, Israel), survey mission on establishing an Agricultural Training Center. Guatemala , Guatemala City. One week MASHAV mission on establishing cooperation with The Central Agricultural School (ENCA ). El Salvador, San Salvador. 4 days MASHAV mission, Evaluation a Project on Diary Cattle. 1997 Czech Republic, Prague. One-week seminar on Sustainable Agriculture. Cooperation, MASHAV, Czech Rep., Min. of Agriculture. 1998 Ukraine, Kiev. One week MASHAV mission on establishing a project on Dairy Cattle. Cooperation MASHAV, Ukraine Min. of Agriculture. Poland, Stara Pola. One week MASHAV mission. Evaluation of a project of Dairy Cattle. Cooperation MASHAV , Poland Min. of Agriculture. 1998 Hungary, Budapest. One- week MASHAV mission: Evaluation on an Irrigation Project. Cooperation between MASHAV and Hungary Min. of Agriculture. 1998 USA, Doylestown, Pennsylvania, Delaware Valley College ( DVC ), Two week seminar on Sustainable Agriculture. 1998 St. Kitts, Nevis, 3 days seminar on Sustainable Agriculture. 1999 Nicaragua, Leon, Chinandega, Matagalpa. Israel’s Ministry of Foreign Affairs, Center for International Cooperation ( MASHAV ), a relief survey mission, following Hurricane Mitch damage. 1999 Costa Rica, San Jose, A study tour to determine characteristics of a long term MASHAV project on Agricultural Marketing. 1999 El Salvador, San Salvador, An Evaluation on a MASHAV long-term project on Dairy Cattle. 1999 Slovakia, Nitra, International Symposium on “Agricultural Towards the the 21st Century”. 1999 Czech Republic, Prague, the Agricultural University. A course to graduate students on Sustainable Agriculture. 2000 Chile, Concepcion. Concepcion University & Fundacion Chile. A study tour and Workshop on Arid Land Ecology and Reforestation. 2001 Mauritius, St. Pierre. Agriculture Research/ Extension Unit (AREU), A course on Sustainable agriculture. 2001 China, Shandong Province, KenLi, Agricultural Survey and Consulting Mission to Enhance Production. 2001 Ecuador, La Peninsula de Santa Elena. An Agro- Ecological survey and Seminar on Sustainable Agriculture and Fruit Production. Organized by CeDeGe. Sustainable Future: Promoting Earth Ethic. de Chimborazo” (ESPOCH), course on Sustainable Agriculture. Eastren Lanzhou, and conducting a course on Sustainable Agriculture. rehabilitation of the sandy soils of the Tailai County. member of International Jury Committee. Agropecuarias, conducting a course on Sustainable Agriculture. ( UPAEP), conducting a course on Sustainable Agriculture. Regions, Environmental and Engineering Research Inst. Department , consulting mission on a regional R&D Project. in the Guizhou Normal University. Institute of Pomology and floriculture. Katowice, Silesia University. sustainable project of incorporation of the urban and peri urban areas. of sustainable agriculture and food security. experts of the provincial Ministry of agriculture. lecture on the Israeli experience of Sustainable Agriculture. with Heifer Int. China, Chengdu. poverty. Mexico, Lecturing and consulting on Sustainable Agriculture, Universidad De La Salle, Bajio Leon. 2006 Palau Lecturing and consulting on Sustainable Agriculture, Palau Community College (PCC), Koror. advance desert agriculture in Israel. 2006, Mexico, A regional rural Resears and Development ( R&D) proposed project. A study tour in the State of Queretaro . 2006, Mexico, Universidad, Autonoma Zacatecas, Unidad Academica de Agronomia, Participating on a meeting day on Analisis del Trabajo Desarollado , actividades a desarollar, esquema y formas del trabajo para lograr un programa rural regional de Investigacion y Desarollo. 2006, USA, Doylestown Pennsylvania, Delaware Valley College ( DVC ), Two weeks seminar on sustainable agriculture. Agriculture . South West Universities for Nationalities. Agricultural University, on Sustainable Agriculture. 2007, China, Lanzhou University, Gansu. One week course to students and staff on Sustainable Agriculture. China, Inner Mongolia , Alaxa ( Alashan), in cooperation with NGOs ( SEE, OISCA, Heifer), activities of consultancy and lecturing on Combating Desertification. consultancy and lecturing on Combating Desertification. Agriculture and a field study on advance desert farming. to Ph.D. students of the Slovak Agricultural University. provincial Ministry of Agriculture and Water Authorities. member of International jury Committee . course on “Sustainable Agriculture, the Israeli Experience”. Visiting the “Palm Grove Nurseries” and “Gopalan Enterprises”. Sustainable Agriculture on Fukuoka, Nishi Nippon Training Center, Shikoku OISCA TC, Toyota City, OISCA Chubu TC, Hamamatsu, OISCA College for Global cooperation, OISCA Int. Head Quarter, Tokyo. Visiting Takamatsu, presented lecture on Sustainable Agriculture: The general approach and the Israeli experience, to students and staff on the Faculty of Agriculture of the Kagawa University. Visiting Tsukuba, Presented a lecture on Sustainable management of water resources in Israel to researchers of National Institute for Rural Engineering (NIRE) and Japan International Research Center for Agricultural Science (JIRCAS). with The Foundation Nuestra Senora del Camino. course on Sustainable Agriculture and combating desertification. 1987 Three- week seminar, on Arboriculture Fruitiere (French). 1987 Five- week course, on Agricultural Extension in various branches (English). 1988 Six- week course, on Agro forestry (English). 1991 Five week course, on Agricultural Ecology (English). 1991 Four week course, on Food and Grain Storage (English). 1992 Four week course, on Integrated Pest Management (IPM) (English). 1997 Three week workshop, on Regenerative Agriculture (English). A Mechanism for Adapting Agricultural Development to Current Socio-Economic Changes in Israel. Bucharest, Romania, 1992. Agroecology, An Approach of Preventing Ecological Damage in Agricultural Production. Beijing, China, 1993. National and Regional Supporting System to Promote the Export of Cotton (Israel). Dar Es Salaam, Tanzania, 1993. People Security Through Agricultural Production and Rural Development in Developing Countries. Mexico City, Mexico, 1994. Big Business Farm – From Agriculture to Agribusiness. Jerusalem, Israel, 1995. Agro-ecological Aspects of the Peri-urban Process. Netanya, Israel, 1996. Agriculture Under Unfavorable Natural Resources. Geneva, Switzerland, 1996. Sustainable Agriculture in the World, The Israeli Experience .Bangalor India, 1999. The Use of Saline Water for Irrigation of Agricultural Crops. Tianjin, China, 1999. Sustainable Agriculture, the Israeli Experience. Trivandrum, India,2000. The Sustainable Management of Water Resources in the Arid Zone of Israel with Emphasis on Reforestation Activities. Concepcion, Chile,2000. The Agro-Ecological Aspects of “Sustainable Agriculture” in Mauritius, St. Pierre, Mauritius, 2001. Agriculture for the quality on human life, Nitra, Slovakia, 2001. Biodiversity and Environment, Calicut, Kerala State, India, 2002. Microfarm Project using Simplified Hydroponics and Fertigation in the Lerma Chapala Basin. Mexico, 2003. Socio Economic Forms in the Rural Area of the Developing Countries, Related to Food Security. Nitra, Slovakia, 2003. Sustainable Agricultural Methods to Combat Desertification, the Israeli Experience, ECHO 10th Conference, Fort Myers, USA, 2003. Microfarming Techniques for Yak Producers in the Tibetan Area of Muli in SW Sichuan, China. Conference, Chengdu, September, 2004. The Global Aspects to Achieve Food Security through Sustainable Agriculture. SESEC conference, Lausanne, Switzerland , 2005. UN PROGRAMA REGIONAL EN EL ESTADO DE QUERETARO CON EL FIN DE IDENTIFICAR UN PROYECTO EN EL CAMPO DE LA ELECTRICIDAD Y PROYECTO AGRÍCOLA INTEGRAL REGIONAL DE INVESTIGACIÓN Y DESARROLLO. Estado de Quereraro, Mexico, 2006. (UAZ), XII National Mexican Congress of Horticultural Sciences, August 2007..
Vienna Wirtschaftsmuseum tour this August to North Korea and Beijing. Altstadt – (Eintritt für einzelne Besichtigungen z.B. Wolfgang Maderthaner, historian and Director General of the Austrian State Archives, talks about the rich history and the varied tasks of this institution, which is among the most important of its kind in the world. Admission, refreshments and sandwiches free! 04th 06th 2013 19:00 Norbert Leser – 80th Birthday Norbert Leser, political scientist and social philosopher, talks about his rich life in a critical discussion of the Austrian Social Democracy, the Austro-Marxism, Christianity and the Question of God. Wolfgang Wolte, Ambassador, and other personalities worthy life and work of former foreign minister in the presence of the recipient. Moderator: Patrick Horvath (WIWIPOL) Admission, refreshments and sandwiches free! 11th 06th 2013 19:00 Care in the here and now Michaela Moser, philosopher and researcher poverty, pointing to current challenges related to growing poverty and inequality and presents answers and solutions from the perspective of care. Then: Panel Discussion with Mary Maiss, Arlt researcher, and Elizabeth Klatzer, economist. Beijing Air Quality tops 755 and the Chinese living under these conditions will demand change. Beijing rather then Doha or Washington can be expected to become the hub for change on Climate issues. We called this in the Kyoto Year (1997) “WHITE NIGHTS AT NOON” and pointed at ECONOMIC COLLAPSE besides HEALTH HAZARDS among results of inaction. New York had at the time usually an API of 35-80 and when it reached 100 we complained. Now the API in New York is mostly bellow 30. 100-200 is considered unhealthy; 201-300 – Very Unhealthy – and our scale ends at 500 with the 300-500 range termed hazardous. Martin Khor wrote in the Star of September 29, 1997 like a prophecy – “How should we categorize an 850 API – Very Hazardous, Post Hazardous, Extreme Danger? Malaysia’s figures at the time were just 300, but Beijing is now pushing 800! LET US SUGGEST HERE THAT NOT ONLY HEALTH IS AT STAKE – BUT ALSO THE ECONOMY – SOMETHING THAT THE ECONOMY CHIEFS UNDERSTAND BETTER THEN MERE HUMAN HEALTH FACTORS. LET ME ALSO SUGGEST TO THE NYT THAT THEY CAN SAFELY PROMOTE THE ARTICLE TO FRONT PAGE from its location on page 16 – Thus to the THE POLITICAL PAGES. WHEN IT COMES TO CHINA THIS IS NO LESS THEN THE FUTURE OF THE GLOBAL ECONOMY. Fashionably masked women on Saturday outside an amusement park in Beijing. The World Health Organization has standards that judge an air-quality score above 500 to be more than 20 times the level of particulate matter in the air deemed safe. BEIJING — One Friday more than two years ago, an air-quality monitoring device atop the United States Embassy in Beijing recorded data so horrifying that someone in the embassy called the level of pollution “Crazy Bad” in an infamous Twitter post. That day the Air Quality Index, which uses standards set by the United States Environmental Protection Agency, had crept above 500, which was supposed to be the top of the scale. So what phrase is appropriate to describe Saturday’s jaw-dropping reading of 755 at 8 p.m., when all of Beijing looked like an airport smokers’ lounge? Though an embassy spokesman said he did not immediately have comparative data, Beijing residents who follow the Twitter feed said the Saturday numbers appeared to be the highest recorded since the embassy began its monitoring system in 2008. The embassy’s @BeijingAir Twitter feed said the level of toxicity in the air was “Beyond Index,” the terminology for levels above 500; the “Crazy Bad” label was used just once, in November 2010, before it was quickly deleted by the embassy from the Twitter feed. According to the Environmental Protection Agency, levels between 301 and 500 are “Hazardous,” meaning people should avoid all outdoor activity. The World Health Organization has standards that judge a score above 500 to be more than 20 times the level of particulate matter in the air deemed safe. In online conversations, Beijing residents tried to make sense of the latest readings. Pollution levels in Beijing had been creeping up for days, and readings were regularly surging above 300 by midweek. The interior of the gleaming Terminal 3 of the Beijing Capital International Airport was filled with a thick haze on Thursday. The next day, people working in office towers in downtown Beijing found it impossible to make out skyscrapers just a few blocks away. Some city residents scoured stores in search of masks and air filters. Still, there was little warning that the United States Embassy reading would jump above 700 on Saturday. Some people speculated that the monitoring system, which measures fine particles called PM 2.5 because they are 2.5 microns in diameter or smaller, might have malfunctioned once it got beyond 500. But Nolan Barkhouse, an embassy spokesman, said the monitor was operating correctly. It was unclear exactly what was responsible for the rise in levels of particulate matter, beyond the factors that regularly sully the air here. Factories operating in neighboring Hebei Province ring this city of more than 20 million. The number of cars on Beijing’s streets has been multiplying at an astounding rate. And Beijing sits on a plain flanked by hills and escarpments that can trap pollution on days with little wind. Meanwhile, one person hiking at the Great Wall in the hills at Mutianyu, north of Beijing, took photographs of crisp blue skies there. Xinhua, the state news agency, reported on Dec. 31 that Beijing’s air quality had improved for 14 years straight, and the level of major pollutants had decreased. A municipal government spokesman told Xinhua that the annual average concentration of PM 10, or particles 10 microns in diameter or smaller, had dropped by 4 percent in 2012, compared with one year earlier. Chinese officials prefer to publicly release air pollution measurements that give only levels of PM 10, although foreign health and environmental experts say PM 2.5 can be deadlier and more important to track. There has been a growing outcry among Chinese for municipal governments to release fuller air quality data, in part because of the United States Embassy Twitter feed. As a result, Beijing began announcing PM 2.5 numbers last January. Major Chinese cities have had the equipment to track those levels, but had refused for a long time to release the data. A version of this article appeared in print on January 13, 2013, on page A16 of the New York edition with the headline: On Scale of 0 to 500, Beijing’s Air Quality Tops ‘Crazy Bad’ at 755. While the US will fight the notion of a Fiscal Cliff, it is rather action or inaction in China that will impact the Global Economy – is being pointed out by the US Council on Foreign Relations. China’s Eighteenth Communist Party Congress was a triumph for the party’s conservative clique and a victory for the status quo. China’s new leaders want to expand its development as a global cyberpower and increase both defensive and offensive capabilities. But short-term change is highly unlikely while they consolidate their positions. Is China Better Off Than It Was Ten Years Ago? Although China’s economy has grown robustly in the past ten years, economic inequality has increased, the environment has suffered, and tensions have risen in the Pacific. China’s next president should learn from his predecessor’s errors. While the U.S. is preoccupied with confronting the fiscal cliff, how China’s new leaders navigate its economic challenges may turn out to be more important to the global economy. China salvo at Japan: Japanese not welcome at Beijing Marathon – not as runners and neither as sponsors. What about Chinese legally moving to Japan? BEIJING — Japanese runners have apparently been barred from registering for the Beijing Marathon to be held Nov. 25, as the organizer has removed Japan from the nationalities listed on the application form on its official website, it was learned Saturday. While the reasons behind the move are unknown, it could be another retaliatory step by Beijing against Japan’s nationalization of the Senkaku Islands, which are claimed by China. And while Japanese firms helped sponsor last year’s race, none are listed on the organizer’s website this year. The Beijing Marathon has been held every fall since 1981. We find a relationship of the above to the realization that beyond present conflict over territory, there is a realization that Japan is in a state of self imposed decline that is not helped by exclusion of Korean and Chinese immigrants to Japan – so China can be expected to push further its own outwards-reach against the Japanese neighbor. Japan as we know it is doomed. Only a revolution can save it. That’s a hard sell in this notoriously closed country. Salesman-in-chief — surprisingly enough — is a retired Justice Ministry bureaucrat named Hidenori Sakanaka, former head of the ministry’s Tokyo Immigration Bureau and current executive director of the Japan Immigration Policy Institute, a private think tank he founded in 2007. It’s an unlikely resume for a sower of revolution. Sakanaka clearly sees himself as such. His frequent use of the word “revolution” suggests a clear sense of swimming against the current. Other words he favors — “utopia,” “panacea” — suggest the visionary. The nation’s population peaked at 128 million in 2004 and has been in accelerating decline since. By 2050, the government’s National Institute of Population and Social Policy Research estimates, 40 percent of Japanese people will be 65 or over. Twenty-three percent already are, as against a mere 13 percent aged 15 and under. The birthrate is 1.3 children per woman, one of the world’s lowest. The population is set to drop to 90 million within 50 years; to 40 million within a century. No nation, barring war or plague, has ever shrunk at such a pace, and as for aging, there are no historical precedents of any kind. The nation needs a fountain of youth. Sakanaka claims to have found one. “A nation of immigrants” is not something Japan has ever aspired to be. For 250 years from the early 17th century it was quite literally a “closed country” (sakoku). Entering or leaving without special and rare authority were capital offenses. Then came the armed incursion of U.S. Navy “Black Ships” in 1853 — which led, within 15 years, to the pell-mell pursuit of Westernization. Japan’s foreign-born population today, higher than ever before at 1.7 percent of the total, compares with an average 10 percent in other developed nations — 12 percent in the United States. Refugees have been cold-shouldered to an extent widely regarded as disgraceful. He is right that no nation has ever achieved it. Even the U.S., which is proud to call itself a “nation of immigrants,” has never been free from racial and cultural frictions. He is right, too, to maintain that a Japan that does achieve it will be “new” — so new, in fact, that a reader might reasonably wonder: Will it still be Japan? Once Japan actually did set off down Sakanaka’s road — only to hastily double back via Ono’s. That was in the late 1980s and early ’90s, when the bubble economy was expanding to its imminent bursting point and Japan’s labor-hungry factories were working full tilt. The nation’s first-ever mass-immigration program welcomed some 300,000 Japanese-Brazilians to plug the gap. Officials who had had assumed the Brazilians’ Japanese ancestry would smooth the transition were soon disillusioned. The Brazilian culture of exuberance clashed with the native culture of restraint. The language barrier proved hard to breach. Kids with minimal Japanese dropped out of school; some turned to crime. A salsa boom in Japan became a symbol of the cultural cross-fertilization some had hoped would come more naturally, but by 2009 the experiment was over. The government offered to pay migrants’ air fares back to Brazil — if they agreed in writing not to try to return to Japan to work. Ono’s solution to the challenges posed by depopulation and the aging society is to adapt to them — by fitting the able-bodied old into the labor force, and by developing robots and other labor-saving technology. Sakanaka, too, in his 2005 book “Nyukan Senki” (“Immigration Battle Diary”), had envisaged something similar. He called it the “small Japan” option. It would turn Japan into a sort of 21st-century pre-Meiji backwater. Life would be less frenetic but possibly deeper and more meaningful. He’s changed his mind. In his April 2012 book, “Jinko Hokai to Imin Kaikaku” (“Population Breakdown and the Immigrant Revolution”) he compares the sluggish pace of reconstruction since March 2011 with the rapid recovery from much greater destruction after World War II. They would come to stay — as Japanese-resident, Japanese-educated, Japanese-employed Japanese citizens, no different in their rights, opportunities and responsibilities from the native-born. And they would come from all over the world not just a handful of countries, Sakanaka stresses. It sounds fantastic, and in fact, Sakanaka acknowledges, would require legislation now lacking — anti-discrimination laws above all. Ultimately, he believes, an influx of highly skilled foreign nationals trained in Japan will be the salvation of several tottering industries. Agriculture, for example. Does agriculture have a viable future otherwise? He thinks not and offers figures to prove it: Japan’s farming population declined by 750,000 to 2.6 million in the five years to 2010; their average age is 65.8. Fisheries and manufacturing, he says, face similar attrition. Revolutionaries learn to live with that, firm in the conviction that their time will come. Viewing the US Presidential Contest from our corner: Today we have Uri Avnery’s article about Obama who cannot fight in a sily debate unless he is angry, and The NYT article about the family of the Chinese Prime Minister Wen Jiabao that might have been intended to show us what Ann Romney and her five sons could do. We bring here the Uri Avnery article but present only the link to the very long and well researched New York Times article. Interesting how Communist China turned into star-student of capitalism and how anti-Communist Romney embraced them to the point that he did great business with them and instead of being the Mormon Missionary he trained to be, he is now a devotee to the class structure of the New China. 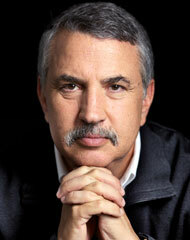 LIBERALISM HAD AND HAS NO PLACE IN CHINA, WILL BECOME EXTINCT IN A ROMNEY US, AND IS IN TROUBLE IN ISRAEL AS WELL. 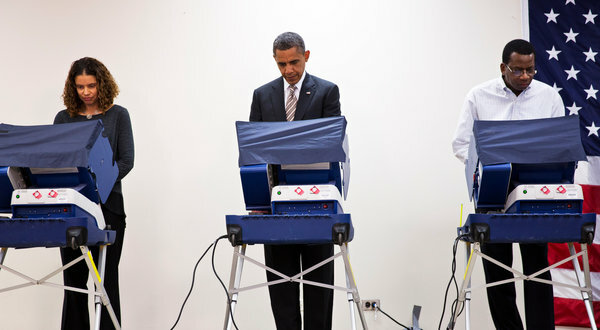 President Obama cast his early ballot Thursday in Chicago. THE MAN WITH THE UZI. October 20, 2012 (after the Second US Presidential Debate and before the Third. When the cannibal chief obliged, the Israeli jumped up, leveled his Uzi and mowed down his captors. “If you had the Uzi all the time, why didn’t you use it before?” he was asked. “I can’t do this unless I am angry,” he replied. BARACK OBAMA’s debating performance reminds me of this joke. At the first confrontation he was listless and lifeless. He just wanted the silly thing to end. During the second debate, he was a changed man. Energetic. Aggressive. Decisive. In short: angry. When the confrontation started, it was 3 a.m. in Israel. I could have recorded it and watched it later. But I was unable to wait. My curiosity got the better of me. Of course, this whole performance is silly. There is no connection at all between talent as a debater and the ability to lead a nation. You can be an outstanding polemicist and unable to conduct a rational policy. Israelis have only to look at Binyamin Netanyahu. You can be a purposeful leader, and fail utterly at expressing yourself. YItzhak Rabin, for example. Yet Americans insist that their leaders demonstrate their prowess as debaters as a condition for being elected. It somehow reminds one of the single combats of antiquity, when each side chose a champion and the two tried to kill each other, in place of mutual mass slaughter . David and Goliath spring to mind. It’s certainly more humane. THE RHETORIC was not directed at the mass of voters. As has been said before, it was aimed at the “Undecideds”, a special class of people. The title is supposed to confer some kind of distinction. For me it makes more sense as an expression of contempt. If you haven’t decided yet, three weeks before the gong sounds, is that something to brag about? At this stage of the game, both candidates must be very careful not to antagonize anyone. Which means, of course, that they cannot afford to present any definite, clear cut, opinion on anything, except motherhood and apple pie – or, in Israel, Zionism and gefilte fish. You must beware of any new idea. God forbid. New ideas create enemies. You may impress a few voters, but most likely you will drive away many more. The trick is to express generalities forcefully. Gun ownership, for example. Guns kill. In strictest confidence, I might disclose to you that guns are produced for this very purpose. Since you are not likely to be kidnapped by cannibals, why for God’s sake keep an Uzi in your cupboard? To keep the Bad Injuns away? Yet even Obama skirted the issue. He did not dare to come out with an unqualified demand to put an end to this nuisance altogether. You don’t mess with the gun lobby. Almost like the pro-Israel lobby. Mitt Romney cited his experience in bringing pro-gun and anti-gun people together to work out a compromise. Like: instead of ten children with assault rifles shooting up their schoolmates, only five per year. I MUST admit that I didn’t quite understand the bitter quarrel about the Benghazi incident. Perhaps you need an American mind to grasp it. My primitive Israeli head just doesn’t get it. Was it a simple terrorist attack, or did the terrorists use a protest gathering for cover? Why the hell does that matter? Why should the President have bothered to falsify the picture this or that way? Israelis know from long experience that after a botched rescue attempt, security services always lie. It’s in their nature. No president can change that. The idea that any country can protect its hundreds of embassies and consulates around the world against all possible types of attack is childish. Especially if you cut their security budget. Apart from these particular issues, both candidates spoke in generalities. Drill, baby, drill! But don’t forget the sun and the wind. Young people must be able to go to college. And get a well-paid job afterwards. The devious Chinese must be shown who’s boss. Unemployment is bad and should be abolished. The Middle Class must be saved. Seems the Middle Class (both in the US and in Israel) makes up the entire population. One may wonder what they are the middle of. One hardly hears of anyone lower or higher on the scale. In short, both candidates made much of the enormous differences between them, but looked suspiciously alike. EXCEPT FOR the color of their skin, of course. But do we dare mention that? Not if we want to be politically correct. The most obvious fact of the campaign is also its deepest secret. I can’t prove it, but my feeling is that race plays a much bigger role in these elections than anyone is ready to admit. In the presidential debates, one cannot get away from the fact that one candidate is white and the other black. One is a WASP (are Mormons protestants? ), the other is half black. The difference is even more striking with the two wives. One cannot be whiter than Ann, or blacker than Michelle. Not mentioning these facts does not make them disappear. They are there. They surely play a role in the minds of many people, perhaps unconsciously. One can only wonder that Barack Hussein Obama was elected in the first place. It shows the American people in the best light. But will there be a backlash this time? I don’t know. RIGHT FROM the beginning, I felt that Obama would win this debate. And win he did. In a previous article, I mentioned that I have many misgivings about Obama. An irate reader asked me what they were. Well, Obama has been giving in to the anti-peace agenda of Netanyahu. After some feeble attempts to get Netanyahu to stop the building of settlements, Obama shut up. Obama must take his share of the blame for the waste of four precious years, during which grievous damage, perhaps irreversible, has been done to Israeli-Palestinian peace. Settlements have been expanded at a frantic pace, the occupation has struck even deeper roots, the Two-State solution – the only one there is – has been seriously undermined. The Arab Spring, which could so easily have been a new beginning for peace in the Middle East, has been squandered. The Arab peace initiative, which has been lying on the table for years, is still lying there, like a wilted flower. American inactivity on this problem has deepened the despair of the Israeli peace forces on the eve of our own elections, removing the idea of peace altogether from public discourse. On the other hand, Obama has prevented Netanyahu from starting a disastrous war. He may have saved the lives of hundreds, even thousands of human beings, Israelis and Iranians, and perhaps in the end Americans. For that alone, we must be profoundly grateful. I HOPE that Obama wins the elections. Or, rather, that the other guy does not . As we say in Hebrew, drawing on the Book of Esther: “Not for the love of Mordecai, but for the hatred of Haman”. This is, of course, a wild exaggeration. I have a lot of real sympathy for Obama. I think that he is basically a decent, well-meaning person. I wish for his reelection, and not only because the opposing ticket is so worrisome. IF OBAMA is elected, what will his second term look like, as far as we are concerned? There is always the lurking hope that a President in his second term will be less subservient to the “pro-Israel” lobby – which is in effect an anti-Israel lobby, driving us on towards national disaster. After being reelected, the second-term President will be relieved of his worry about the lobby, its voters and its money. Not entirely, of course. He will still have to worry about the mid-term congressional elections and about the fate of his party in the next presidential round. Still, he will have much more leeway. He will be able to do much more for peace and change the face of the Middle East. As our Arab cousins say: Inshallah – God willing. If the growing Chinese middle-class – to number 800 million in 2025 – would want to live by the American Dream this requires a second Planet Earth. The hope is that incoming Chairman Xi Jinping, to be annointed November 8, 2012, just two days after the US Presidential election, will develop a new Sustainability Dream for a Progressive China. For the World at large this is more important then who will be US President. Published: October 2, 2012, A version of this op-ed appeared in print on October 3, 2012, on page A27 of the New York edition with the headline: China Needs Its Own Dream. Nov. 8, China is set to hold the 18th National Congress of the Communist Party. We already know who will be the next party leader: Vice President Xi Jinping. What we don’t know is what matters: Does Xi have a “Chinese Dream” that is different from the “American Dream?” Because if Xi’s dream for China’s emerging middle class — 300 million people expected to grow to 800 million by 2025 — is just like the American Dream (a big car, a big house and Big Macs for all) then we need another planet. Spend a week in China and you’ll see why. Here’s a Shanghai Daily headline from Sept. 7: “City Warned of Water Resource Shortage.” The article said: “Shanghai may face a shortage of water resources if the population continues to soar. … The current capacity of the city’s water supply was about 16 million tons per day, which is able to cover the demand of 26 million people. However, once the population reaches 30 million, the demand would rise to 18 million tons per day, exceeding the current capacity.” Shanghai will hit 30 million in about seven years! Liu, an M.I.T. graduate and former McKinsey consultant, argues that Chinese today are yearning to create a new national identity, one that merges traditional Chinese values, like balance, respect and flow, with its modern urban reality. She believes that the creation of a sustainable “Chinese Dream” that breaks the historic link between income growth and rising resource consumption could be a part of that new identity, one that could resonate around the world. Chinese are more open to this than ever. A decade ago, the prevailing attitude was, “Hey, you Americans got to grow dirty for 150 years. Now it is our turn.” A couple of weeks ago, though, I took part in the opening day of Tongji University’s Urban Planning and Design Institute in Shanghai and asked students whether they still felt that way. I got a very different answer. Zhou Lin, a graduate student studying energy systems, stood up and declared, with classmates nodding, “You can politicize this issue as much as you want, but, in the end, it doesn’t do us any good.” It is not about fairness anymore, he said. It is in China’s best interest to find a “cleaner” growth path. To say China needs its own dream in no way excuses Americans or Europeans from redefining theirs. We all need to be rethinking how we sustain rising middle classes with rising incomes in a warming world, otherwise the convergence of warming, consuming and crowding will mean we grow ourselves to death. So Xi Jinping has two very different challenges from his predecessor. He needs to ensure that the Communist Party continues to rule — despite awakened citizen pressure for reform — and that requires more high growth to keep the population satisfied with party control. But he also needs to manage all the downsides of that growth — from widening income gaps to massive rural-urban migration to choking pollution and environmental destruction. The only way to square all that is with a new Chinese Dream that marries people’s expectations of prosperity with a more sustainable China. Does Xi know that, and, if he does, can he move the system fast enough? So much is riding on the answers to those questions. China and Syria? Is it only an effort by China To show they are a major Global Player as well? Welcome, but please show results by leading the sides to a negotiation table. How about backing the new negotiator – the Algerian Arab Elder Lakhdar Brahimi? BEIJING – Chinese Foreign Minister Yang Jiechi on Thursday met with Bouthaina Shaaban, the Syrian president’s special envoy and political and media adviser, on the current situation in Syria. During the meeting, Yang said China is deeply concerned about the situation in Syria, which has become more and more severe recently. China urges the Syrian government and parties concerned to implement UN Security Council resolutions, Annan’s six-point proposal and the Geneva communique agreed by the Action Group meeting of major world powers on June 30, immediately cease fire, stop violence and launch political dialogue, the foreign minister said. He said China calls on the Syrian government and the opposition to start dialogue at an early date, initiate and push forward a political process led by the Syrian people so as to bring the nation out of its difficulties. The international community and other parties involved need to play a positive role on the issue, according to Yang. The Syrian government must take substantial measures to meet the reasonable needs of the Syrian people to seek reform and safeguard their own interests, he added. China hopes the Syrian government and the opposition coordinate with the international mediation efforts, Yang said. He also briefed Shaaban on contact between China and the opposition groups in Syria and those dialogues’ mediation efforts, as well as China’s humanitarian assistance to Syrian refugees. 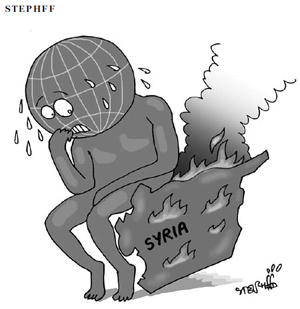 Shaaban introduced the current situation in Syria. She said Syria’s government will coordinate with international mediation efforts, and is ready to work with relevant parties to seek ways to make the government forces and the opposition forces stop violence at the same time. She said the Syrian government is willing to launch an inclusive dialogue with the opposition so as to promote a Syria-led political process and restore security and stability in the country. 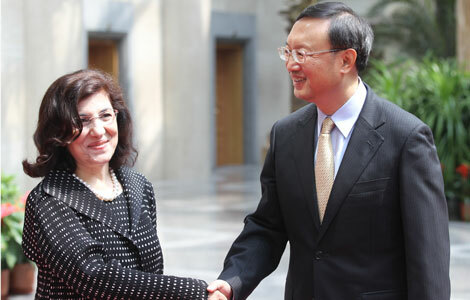 Vice Foreign Minister Zhai Jun also met with Shaaban on Thursday. Lakhdar Brahimi is a former UN envoy to Afghanistan and Iraq and former Under-Secretary General of the Arab League. Mr Brahimi is a member of the Elders group, alongside Kofi Annan and Nelson Mandela. He also served as Algerian Foreign Minister between 1991 – 1993. The United States welcomes the decision by United Nations Secretary General Ban Ki-moon and League of Arab States Secretary General Nabil El Araby to appoint a new Joint Special Representative for Syria. Lakhdar Brahimi will continue the pursuit of an end to the conflict and a peaceful transition in Syria. Five months ago, Kofi Annan agreed to take on the serious task of trying to bring an end to the brutal violence and forge a path toward a peaceful transition and a post-Assad Syria that is inclusive and representative of all Syrians. We are grateful for Mr. Annan’s service. My message to Special Representative Brahimi is simple: The United States stands ready to support you and secure a lasting peace that upholds the legitimate aspirations for a representative government of the people of Syria. And to the Syrian people: you are not alone. The international community remains fully committed to a Syrian-led political transition leading to a pluralistic political system representing the will of the people. The international community is also committed to ensuring that those who commit atrocities will be identified and held accountable. Romney Is indeed a good Olympian – see how bad rules punished eight competitors that made the best of the bad rules – so did Romney when he hid his money from taxes under what were clearly tax regulations set up to favor people like him. Olympic Ideal Takes Beating in Badminton. It is not strange at all what happened, people will tend to take advantage of bad rules – it is the best (or the richest in Romney’s case) that can take advantage of bad rules – it seems that the rules were skewed in their favor in the first place. On Tuesday night at the London Games, some of the world’s best badminton players hit some of the sport’s worst shots. Sad serves into the net. Returns that sailed far wide. Howls from the crowd were loud and instant, and the calls for investigation immediate. On Wednesday, four women’s doubles teams — two from South Korea and one each from China and Indonesia — were disqualified. But the circumstances were complicated by the fact that the rules of the sport seemed to give the athletes an incentive to lose. The eight players were found to have tried to lose their matches intentionally, apparently because they had determined that a loss would allow them to play a weaker opponent in the next round. Badminton officials introduced a preliminary round at the Olympics this year so that each team could play at least three times and not risk traveling thousands of miles only to be eliminated in the first match. But athletes and coaches have always looked for any available advantage, including throwing a match to save energy or to face an easier opponent in the next round. There was nothing subtle about how the four teams of players — all of whom had already qualified for the quarterfinals — performed Tuesday night. They repeatedly served into the net and hit shots well out of bounds. During one match, a Danish umpire took the drastic step of flashing a black card to warn the players that they could be thrown out. The disqualifications threw the tournament into turmoil and prompted protests and calls for rule changes. Indonesia appealed the decision and then withdrew the appeal, while the South Koreans had their appeal denied after officials reviewed the matches, interviewed the umpires and spoke to the players. The eight disciplined players, who were found to have not tried their best and to have conducted themselves “in a manner that is clearly abusive or detrimental to the sport,” had been scheduled to play Wednesday. After their sudden exits, they were replaced by women’s doubles teams from Australia, Canada, Russia and South Africa. No coaches or teams were penalized. Though rare, examples exist for cases in which a quirk of a sport’s rules or competition format has given an athlete or team an incentive to lose — or at least not try hard. In a World Cup soccer match in 1982, West Germany and Austria appeared to stop trying after West Germany took a 1-0 lead early in the game. Both teams knew that such a result would allow them to advance. That prompted soccer officials to mandate that the final games in a round-robin group-play format must all be played at the same time so teams could not know the outcome of other important matches. The charges of match throwing have been biting, with teams from Western nations taking aim at their Asian counterparts, especially the Chinese. Niels Nygaard, the president of the national Olympic committee in Denmark, which has some of the best badminton players in Europe, applauded the world federation’s decision and blamed the coaches, not the players, for the persistent match throwing. “For me, it’s really a matter of principle whether things are done in a correct way,” Nygaard said after the announcement. Still, the tactic of purposely losing has an inner logic that has been used in other sports like soccer and baseball. When Wang Xiaoli and Yu Yang from China lost to the South Koreans Jung Kyung-eun and Kim Ha-na on Tuesday, they were trying to avoid playing the world’s second-ranked women’s pair of Tian Qing and Zhao Yunlei, from China. Ha Jung-eun and Kim Min-jung of South Korea and Meiliana Jauhari and Greysia Polii of Indonesia also tried to steer clear of high-level foes in the quarterfinals. This being Britain, where a bet can be laid on practically any event, the question of whether the match was thrown for profit is reasonable. Kate Miller, a spokesman for William Hill, one of Britain’s largest betting companies, said her 200-person trading team did not spot any irregularities surrounding the match. And badminton was not the only sport in which teams trotted through a preliminary-round game. On Tuesday, in Cardiff, Wales, the Japanese women’s soccer team, the 2011 World Cup champion, played to a scoreless tie against a much weaker South African side. The tie, as opposed to a win, meant that the Japanese, who had already qualified for the knockout round, avoided having to travel to Glasgow to play France in the quarterfinals. Instead, they will remain in Cardiff and play Brazil. The House and Senate voted to close a loophole in an insider trading law that could have allowed lawmakers’ family members to profit from inside information. CNN uncovered and reported on the loophole last month. The STOCK Act, one of the rare bipartisan bills passed this year, was signed by President Barack Obama in April. Someone sneaked into law “the possibility to cheat by law” by telling your wife to buy stocks based on your inside information – how neat indeed! Air Pollution measurements become a China State Secret if they contend that Foreign embassies are not allowed to warn of air pollution indices. A PHOTO FROM CHINA – THIS IS NOT BECAUSE THEY CANNOT TALK – THIS IS BECAUSE THEY CANNOT BREAZE THE AIR! A woman wears a face mask as she walks along a main road in Beijing June 4, 2012. A senior Chinese official demanded on Tuesday that foreign embassies stop issuing air pollution readings, saying it was against the law and diplomatic conventions, in pointed criticism of a closely watched U.S. embassy index. The level of air pollution in China’s heaving capital varies, depending on the wind, but a cocktail of smokestack emissions, vehicle exhaust, dust and aerosols often blankets the city in a pungent, beige shroud for days on end. Many residents dismiss the common official readings of “slight” pollution in Beijing as grossly under-stated. The U.S. embassy has installed a monitoring point on its roof which releases hourly air-quality data via a widely followed Twitter feed. The U.S. consulates in Shanghai and the southern city of Guangzhou provide a similar service. While China tightened air pollution monitoring standards in January, the official reading and the U.S. embassy reading can often be far apart. Chinese experts have criticized the single U.S. embassy monitoring point as “unscientific”. Deputy Environment Minister Wu Xiaoqing went a step further, saying such readings were illegal and should stop, though he did not directly name the United States. “According to the Vienna Convention on Diplomatic Relations … foreign diplomats are required to respect and follow local laws and cannot interfere in internal affairs,” Wu told a news conference. Chinese Foreign Ministry spokesman Liu Weimin called on foreign diplomatic missions to respect China’s laws and regulations and to stop issuing the readings, “especially over the Internet”. The U.S. embassy acknowledges on its website beijing.usembassy-china.org.cn) that its equipment cannot be relied upon for general monitoring, saying “citywide analysis cannot be done … on data from a lone machine”. Despite his criticism, Wu acknowledged that China’s air quality and overall environmental situation remained precarious, with more than one tenth of monitored rivers rated severely polluted, for example. The Harvard Educated Dr. Lobsang Sangay, Secular, Democratically elected, Tibetan Prime Minister-in-Exile was born in India and was never in Tibet, he is reaching out for cultural authonomy of Tibet within China. INTERVIEW | FLORIAN NIEDERNDORFER, 26. Mai 2012, Der Standard. Lobsang Sangay und Tenzin Gyatso, der 14. Dalai Lama, bei einer Pressekonferenz in Wien. Von seinem Hotelzimmer in der Wiener Innenstadt aus überblickt Lobsang Sangay die Bundeshauptstadt, wo er am Nachmittag gemeinsam mit dem Dalai Lama eine Kundgebung von Exil-Tibetern besuchen wird. Danach fliegt der 2011 ins Amt gewählte Chef der international nicht anerkannten tibetischen Exilregierung zurück nach Indien, wo er geboren wurde und bis heute residiert. Im Gespräch mit derStandard.at erzählt der Exil-Premier über seinen Einfluss auf den tibetischen Widerstand gegen die chinesischen Behörden und seine Vision eines gewaltfreien Kampfes für mehr Autonomie seiner Landsleute. derStandard.at: Sie waren noch nie in Tibet. Wie hoch kann dann Ihr Einfluss auf die Menschen dort sein? Lobsang Sangay: Das ist natürlich schwer abzuschätzen. Auf YouTube zum Beispiel gibt es viele Lieder, die von Musikern aus Tibet geschrieben wurden. Bisher waren diese fast ausschließlich dem Dalai Lama gewidmet. Heute gibt es schon einige Stücke, die mir gewidmet sind. Etwa eines, das übersetzt “Drei Löwen” heißt. Löwe ist mein zweiter Vorname und die Flagge Tibets schmücken zwei Löwen. Wenn Menschen in Tibet es wagen, Lieder über mich auf YouTube zu stellen, bedeutet das doch dass es eine wachsende Aufmerksamkeit und Akzeptanz für meine und unsere Arbeit gibt. Ich habe tausende Tibeter in Indien getroffen, manche haben zu weinen begonnen, als sie mich sahen. Natürlich hat das nicht unbedingt etwas mit mir persönlich zu tun, sondern mit meiner symbolischen Funktion als demokratisch gewählter Exilpremier. derStandard.at: Wie stellen Sie sich Ihre Ankunft in Tibet vor, sollten Sie eines Tages Ihr Ziel erreichen und Ihr Vaterland besuchen können? Lobsang Sangay: Natürlich male ich mir dafür ein sehr romantisches und idealistisches Szenario aus. Mir ist aber auch klar, dass es politisch schwierig werden könnte. Egal welche Probleme dann auftauchen, mental gesehen werde ich wohl tief durchatmen und sagen, jetzt bin ich zurück in meinem Heimatland. Ganz sicher wird es ein sehr emotionaler und glücklicher Tag sein. derStandard.at: Warum hat die tibetische Freiheitsbewegung so viele Unterstützer auf der ganzen Welt, während sich um Kurden oder Roma vergleichsweise wenig Menschen kümmern? Lobsang Sangay: Man kann zurückgehen bis zu Shangri-La von James Hilton (ein fiktiver, literarischer Ort im Himalaya, Anm. ), wo schon vom exotischen Tibet gesprochen wurde. Dazu kommt sicher die Popularität des Buddhismus im Westen und die ethisch-politische Agenda des Dalai Lama, die heute weit mehr umfasst als die Religion. Seine Botschaft von Gewaltlosigkeit und Frieden ist universell. Die Menschen im Westen sehen aber auch, dass wir als Exiltibeter in Demokratie investiert haben. Natürlich wurden große Führer wie Gandhi oder Nelson Mandela von den Indern und Südafrikanern als Ikonen akzeptiert, aber demokratisch gewählt wurden sie nicht. Wir Tibeter haben in mehr als vierzig Ländern an einem einzigen Tag einen Anführer gewählt. Diese innere Demokratie geht Menschen im Westen nahe. derStandard.at: Es gibt aber Stimmen, etwa unter tibetischen Studenten, die sich für radikaleren Widerstand gegen China aussprechen. Sehen Sie die Gefahr der Spaltung Ihrer Bewegung? Lobsang Sangay: Es wird in jeder Bewegung immer unterschiedliche Meinungen geben. Wir treten für echte Autonomie innerhalb Chinas ein, manche Studenten wünschen sich die vollständige Unabhängigkeit Tibets. Das sind aber nur Minderheiten. Wir müssen sicherstellen, dass es nicht zu einer Fraktionsbildung kommt und dass wir keine Flügelkämpfe erleben müssen. derStandard.at: Wie gedenken Sie denSelbstverbrennungen, über die in den vergangenen Monaten viel berichtet wurde, Einhalt zu gebieten? Lobsang Sangay: Wir rufen grundsätzlich nicht zu Protesten innerhalb Tibets auf, weil das zu gefährlich ist und die Konsequenzen von Seiten der chinesischen Behörden zu scharf sind. Was die Selbstverbrennungen betrifft rufen wir selbstverständlich nicht dazu auf, im Gegenteil, wir versuchen diese Menschen davon abzuhalten. Mehr können wir nicht tun. Sehr wohl sind wir mit den Zielen dieser Menschen aber solidarisch und rufen dazu auf, ihrer zu gedenken. Das ist unsere heilige Pflicht. derStandard.at: Was würde mit den Millionen Han-Chinesen passieren, die heute in Tibet wohnen? Lobsang Sangay: Han-Chinesen und Tibeter haben immer schon nebeneinander gelebt, tausende Jahre lang. Der Geburtsort des Dalai Lama etwa war damals schon hauptsächlich von Chinesen bewohnt. Ich habe in Harvard hunderte Chinesen kennengelernt, viele meiner Freunde sind Chinesen. Es geht nicht um die Menschen, sondern um die Hardliner in Peking, die die Völker gegeneinander aufhetzen. Wir haben uns natürlich überlegt, was wir gegen die Aushöhlung der tibetischen Identität im Falle einer echten Autonomie tun könnten. Denn wenn die Han-Chinesen uns überrollen, verliert die Autonomie ihren Sinn. Aber gerade wenn wir innerhalb Chinas bleiben, sind wir ja an die Gesetze Chinas gebunden, die logischerweise jede Diskriminierung von Han-Chinesen verbieten. derStandard.at: Woher kommt die Verbindung des Dalai Lama zu Österreich? Lobsang Sangay: Das österreichische Volk hat immer schon besonderes Interesse für die Belange der Tibeter gezeigt. Natürlich liegt das auch an der Herkunft Heinrich Harrers. Der Dalai Lama hat wenige Länder in Europa öfter besucht als Österreich. Es scheint aber auch, dass Österreicher sich besonders für Umwelt- und Menschenrechtsangelegenheiten interessieren. derStandard.at: Wer hat Ihre Reise nach Wien bezahlt? Der in Harvard ausgebildete Jurist Lobsang Sangay (44) ist seit 2011 Premierminister der tibetischen Exilregierung im nordindischen Dharamsala. The Austrian Press Agency reports on two self-immolations in Lhasa, Tibet, and on The Dalai Lama remark in Vienna that had he been voting in Austria he would have gone with the opposition Green Party. His Holiness spoke about Universal Responsibility when talking about Ethics. Selbstverbrennungen erreichen Tibets Hauptstadt Lhasa. Zumindest einer von zwei Mönchen bei Protestaktion gegen chinesische Okkupation getötet. Peking – Aus Protest gegen die chinesische Tibet-Politik haben sich in der tibetischen Hauptstadt Lhasa zwei Mönche selbst angezündet. Dabei wurde mindestens einer der beiden getötet, wie die amtliche chinesische Nachrichtenagentur Xinhua am Montag meldete. Es waren die ersten Selbstverbrennungen in Lhasa selbst. In der seit 2009 andauernden Serie von Selbstverbrennungen aus Protest gegen die chinesische Herrschaft war es das erste Mal, dass sich Tibeter direkt in der tibetischen Hauptstadt mit Benzin übergossen und angezündet haben. Der zweite Mönch sei schwer verletzt, berichtete Xinhua weiter. Polizisten hätten die Flammen in wenigen Minuten gelöscht. Ein ranghoher kommunistischer Vertreter der Region, Hao Peng, verurteilte den Vorfall. Damit solle Tibet von China getrennt werden. Laut dem in den USA ansässigen Sender Radio Free Asia (RFA) gehörten die beiden Mönche offenbar zu einer Gruppe Jugendlicher, die sich am Sonntag vor dem Jokhang-Tempel versammelt hatten, um gegen die chinesische Herrschaft in der autonomen Region zu protestieren. Laut von dem US-Sender zitierten Zeugen erschienen sofort Sicherheitskräfte, die das Feuer löschten und alle Touristen aus der Gegend verbannten. Innerhalb von 15 Minuten sei der Bereich gesäubert gewesen, und von dem Vorfall habe es keine Spur mehr gegeben. Die Sicherheitsmaßnahmen in Lhasa wurden umgehend verschärft. Die Lage sei angespannt. Polizisten und paramilitärische Kräfte seien überall in den Straßen zu sehen. Es handelte erst sich um die zweite Selbstverbrennung in Tibet selbst. In den vergangenen drei Jahren sind insgesamt 35 Fälle in China bekanntgeworden, wo Tibeter sich selbst verbrannt haben, die meisten davon in von Tibetern bewohnten Provinzen Chinas, insbesondere in der Südwestprovinz Sichuan. Der Gelehrte Tsewang Nyima, in Peking, über Selbstverbrennungen von Mönchen und den Status quo. STANDARD: Seit März 2011 hat es über 35 Selbstverbrennungen von tibetischen Mönchen und Nonnen gegeben. Warum? Nyima: Sie sind verzweifelt, weil die tibetische Kultur zugrunde geht (schluchzt). Selbstverbrennungen sind die letzte Maßnahme, um Aufmerksamkeit auf Tibet zu lenken. Die Lage hat sich seit 2008 dort sehr verschlechtert. Massendemonstrationen werden im Keim erstickt. Selbstverbrennungen können die Chinesen dagegen kaum kontrollieren. Nyima: … und die Olympischen Spiele in China. Seitdem sind in den Städten und in der Umgebung der Klöster in Tibet viele Soldaten und zivile Polizisten stationiert, die eine scharfe Kontrolle ausüben. Wer nur einen Hauch Negatives über China sagt, muss fürchten, festgenommen zu werden. STANDARD: Haben die Selbstverbrennungen etwas bewirkt? Nyima: Für die Verbreitung der politischen Situation war es sehr hilfreich, weil man jetzt darüber spricht und viele Menschen sich fragen, was in Tibet geschieht. Aber nun ist es wichtig, dass die Regierungen darauf reagieren und Tibet politisch mehr unterstützen – auch gegenüber China. STANDARD: Wie vollzieht sich der Untergang der tibetischen Kultur? Nyima: Zum Beispiel über die Sprache. Tibetisch wird in Privatschulen von der ersten bis zur sechsten Klasse angeboten, an weiterführenden Schulen kaum. Wer die höheren Universitäten besuchen will, muss sich auf Chinesisch konzentrieren. Kinder, die zuerst Tibetisch lernen, sind da im Nachteil. In der Alltagssprache sind viele Begriffe durch chinesische verdrängt worden. Und die Mönche in den Klöstern haben politische Unterweisungen und werden dazu gezwungen, sich gegen den Dalai Lama zu stellen. STANDARD: Glauben Sie, dass eine gemeinsame Lösung des Konflikts mit den Chinesen möglich ist? Nyima: Wir wollen keine Trennung von Chinesen und Tibetern, das ist auch nicht mehr möglich. Aber wir wollen eine Autonomie, sodass Tibet von den Tibetern regiert wird, ohne dass Chinas Führung von Peking aus mitredet. Aber wegen der chinesischen Unterwanderung drängt die Zeit. STANDARD: Was erwarten Sie von der neuen chinesischen Führung, die im Herbst antritt? Tsewang Nyima (74) ist ein hochrangiger Gelehrter des tibetischen Buddhismus. Er wurde in der tibetischen Hauptstadt Lhasa geboren und floh im Zuge des Tibetaufstands 1959 ins Exil. Seine Ausbildung zum geistigen Lehrer begann er mit neun Jahren. 1980 wurde ihm der höchste Titel des “Geshe Lharampa” verliehen. Er lehrt u. a. im Thosamling-Kloster nahe Dharamsala in Indien. Exiltibeterchef zeigt Sympathie für die Grünen – Treffen mit Vizekanzler Spindelegger. Im Anschluss an den Vortrag traf das geistliche Oberhaupt der Tibeter auf Vizekanzler und Außenminister Michael Spindelegger (VP). Würde er einer Partei zugehören, wären dies jedoch die Grünen, ließ der Dalai Lama im Beisein des Vizekanzlers wissen. Das Publikum goutierte die Aussage mit spontanem Applaus. “Ich kenne aber die Partei des Herrn Ministers nicht”, fügte er hinzu. Die Gewalt heutzutage sei ein “Versäumnis des vergangenen Jahrhunderts”, Terrorismus sei nur einer der Auswüchse dessen, erklärte der Dalai Lama in seinem Vortrag vor rund 10.000 Zuhörern. Nichtsdestotrotz zeigte er sich optimistisch, dass dieses Jahrhundert “ein besseres” wird. Dies sei aber auch “von unseren eigenen Bemühungen abhängig”, mahnte der Friedensnobelpreisträger. Ein wichtiges Element dabei sei Bildung. “Durch Bildung können wir ein glücklicheres Jahrhundert schaffen”, betonte der Dalai Lama. “Vom Kindergarten bis zur Universität” müssten nach Ansicht des tibetischen Oberhauptes die wichtigsten gesellschaftlichen Werte wie Ehrlichkeit, Offenheit und Vertrauen gelehrt werden. Dadurch gewinne der Mensch Selbstvertrauen und könne “universelle Verantwortung” entwickeln. Er trete für eine “säkuläre Entwicklung der menschlichen Werte” ein, erklärte der 14. Dalai Lama, Tenzin Gyatso. Säkularismus will der Dalai Lama in der indischen Definition verstanden wissen. Es bedeute für ihn, alle Religionen und auch diejenigen Menschen zu respektieren, die keiner Religion angehören. Generell hob der Religionsführer immer wieder das “Gemeinsame” hervor, das über das Trennende zu stellen sei. “Wir sind alle gleich, auch ich bin nichts Besonderes”, hatte er auch bei einer Pressekonferenz am Vormittag gesagt. “Mental, physisch und emotional bin ich einer von euch”, stellte er vor der begeisterten Menge in der Stadthalle fest. Die “Einheit der Menschheit” sei deshalb so wichtig, weil “ohnehin alles voneinander abhängig” ist. Die eigenen Interessen seien immer auch gemeinsame Interessen, sagte der Dalai Lama. Als oberstes Ziel nannte er ein “friedvolles Zusammenleben”, dies bedeute, “anderen zu helfen” oder “zumindest keinen Schaden zuzufügen”.